Films can be funny, but this is humor about films: parodies, satires, and more. The Internet has inspired a revolution in Sesame Street's relevancy. Always a wonderful tool for educating children not just in reading, writing, and arithmetic, but also in social skills such as cooperation and patience, these values are now being encased in many wonderful YouTube videos whose humor will appeal to adults as well. Nowhere is this more evident than in the show's newest segment, "Cookie's Crumby Pictures", in which Cookie Monster teaches kids self-regulation and executive function skills in the form of parodies of Hollywood's latest big-budget hits. Despite Cookie being the leading role, Pita nearly stole the show. What an improvement over the original! You can also see Cookie Monster as Captain Snack Sparrow in Cookies of the Caribbean and as an earnest martial arts student in in The Biscotti Kid. See the playlist for the full catalog of parodies. It just goes to show: everything is better with Muppets! It is a good time to be a fan of Mystery Science Theater 3000. The television show spent ten years lampooning some of the worst films ever created, and this week, 25 years after the show's debut, the comedy just keeps on coming. If you didn't catch this show during its decade on the air, or you're missing your favorite episodes, Shout! Factory has you covered. All this month, they've been celebrating the show's 25th anniversary with daily sales on select DVD sets. But why settle for one a day? This Thursday and Friday, ALL previous sales will return simultaneously. Engorge yourself with your favorite box sets at MST3KTurkeyDay.com. There are still more box sets to come, with the 25th Anniversary Edition having been released just yesterday, and another box set — the show's 29th! — announced as coming next year, containing some of the best episodes ever. Want to watch MST3K show live like it's 1988? A tradition long gone from our world returns this Thanksgiving, thanks to show founder Joel Hodgson. The MST3K Turkey Day Marathon is back, with six favorite episodes airing starting at noon ET, again at MST3KTurkeyDay.com. Reruns are great — but what about the future? After MST3K concluded its run, its hosts continued the comedy with two similar troupes: Cinematic Titanic, hosted by Joel Hodgson, and RiffTrax, spearheaded by Michael J. Nelson. Cinematic Titanic focused on DVDs and live tours and will be concluding their farewell tour next month. I caught them on all three of their visits to Boston, most recently on November 2, when they subjected their audience to a terrible movie, The Doll Squad. Hodgson engaged in Q&A with the audience, but more impressively, he yesterday conducted a Reddit "Ask Me Anything" (AMA). Generations of fans paid tribute and got sincere, thorough answers to their questions about the past, present, and future of Hodgson's comedy exploits. 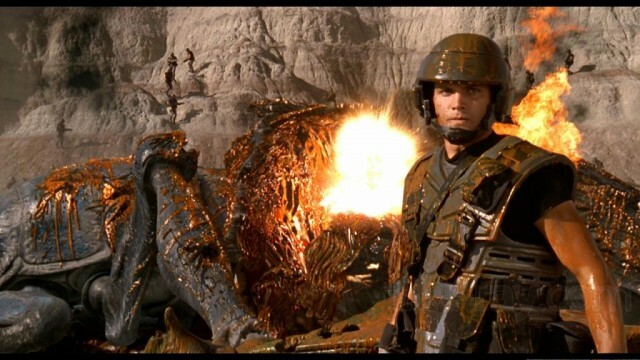 Meanwhile, RiffTrax continues to publish audio commentary MP3s to accompany your favorite blockbuster films, from Starship Troopers to Twilight. Their next live event is a holiday riffing of Santa Claus Conquers the Martians on December 5 at 8 PM ET. Tickets are now on sale, and these events have been known to sell out, so get yours today! This holiday season, I am thankful for the talented artists who have brought so much laughter into my home, and the many friends with whom I've shared those experiences. We have movie sign!! Filed under Humor; 2 comments. This is no indie work — it features cameos by both director Peter Jackson (who turns 51 today!) and Gollum. Impressive! I have flown seven flights in the last two weeks, and many more than that every year. Not once have I ever found an instructional safety video that gripped my attention like this one. When else have you ever found yourself indulging in this genre on YouTube? Well done, Air New Zealand! I look forward to visiting Middle-Earth soon. In 2012, four Marvel superheroes combined their franchises into one summer blockbuster: The Avengers. This team consisting of Iron Man, Captain America, Thor, and The Incredible Hulk was assembled by agents of the secret military agency known as Strategic Homeland Intervention, Enforcement and Logistics Division — SHIELD for short. ABC wants to know more about this agency and has ordered a television pilot. Best of all, they're tapping Avengers director Joss Whedon — creator of Buffy, Dollhouse, and Dr. Horrible — to co-write and possibly direct. I'd hire him. Wouldn't you? And if you don't get the closing joke to Adam, you need to see "Once More, With Feeling"! GalaxyQuest was a funny movie for a general audience and hilarious for lovers of Star Trek. Conversely, I can't imagine anyone but Trekkies who will appreciate John Scalzi's latest book, Redshirts — but boy, will they love it! Set on a fictional starship, the book parrots almost every element of the Star Trek universe — or, more precisely, the television show. When lowly ensigns start to realize that they're always the ones to die on away missions, and "main characters" never do, they start to look into exactly why. What they discover is as surprising as it is riveting. Yet after the story is done, three codas told from three different perspectives, making for a total of 70+ pages of "bonus" material, do more than pad out an otherwise relatively short tale. These chapters adopt a completely different tone, hitting a variety of emotional cues and balancing the story out. Redshirts is a quick and fun read that you'll be sorry to see end — heck, it's even good enough to have its own theme song by Jonathan Coulton. I highly recommend it to all geeks. I'm not trying to be hip when I say "I liked Transformers before Transformers were cool." Because the fact is that Transformers aren't cool — not since Michael Bay got his filthy paws all over them and turned Optimus Prime into a vengeful sociopath. Maybe it's not fair to have high standards for a children's cartoon based off a line of toys, but as an adult, I've revisited many of my childhood's fondest memories, and few have stood up as well as the original Transformers animated series. Even today, when political pundits write stirring calls for action and cite the Transformers ethos, they are referring to the source material, not Bay's adaptation. But I understand that franchises must either adapt to the times or make way for new properties to ensconce themselves in a child's heart. Perhaps a combination of those two approaches is the way for Transformers to remain both relevant and beloved. Why not meld it with a proven entity? Thomas the Tank Engine has been around since 1946, but as my nephew demonstrates, he continues to be popular with kids. An enterprising artist named James Farr sees this as a natural mashup and has created an entire series based on the idea. "Thomas the Transforming Tank Engine defends the Island of Sodor against a host of villainous engines bent on destroying the world" in… TRAINSFORMERS. There are at present four videos, with new ones announced via Facebook and Twitter. My favorite is the second video, as it seems the most perfect amalgam with the least backstory needed — though the stories do seem to get darker and more violent as the series progresses. How long before Michael Bay ruins this indie effort with a big-budget blockbuster? See also the 2009 mashup, Transforminators.